Hurdles are one of the most disrespectful ways someone can get past his opponent on the football field. The move not only makes for an incredible highlight, it also makes a defender look smaller and sillier than in most other evasive maneuvers. But hurdles also carry the risk making a ball carrier look like a child being rag-dolled by a grown man, as Arizona State quarterback Manny Wilkins learned on Saturday during the Las Vegas Bowl. On a third-and-three from his team’s own 38-yard line, Wilkins dropped back to try and complete the short-yardage pass for the first down. When he saw that none of his receivers were open, the quarterback rolled out to his left and tried to scramble for the three yards. Wilkins attempted to hurdle Fresno State linebacker James Bailey, who turned his third-down rush attempt into a six-yard sack. It’s not like Wilkins isn’t known for his mobility. This season for the Sun Devils, he rushed for 416 yards on 101 attempts—including one for 45 yards—and scored eight touchdowns with his legs. 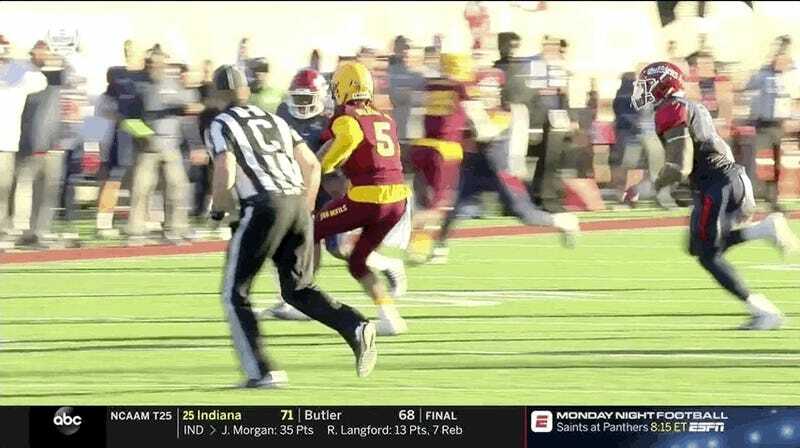 But he should maybe calm down on the hurdle attempts considering this also isn’t the first time this season he’s tried to jump over a defender with poor results. He’s certainly not as spry as he used to be. Maybe just slide next time, dude.